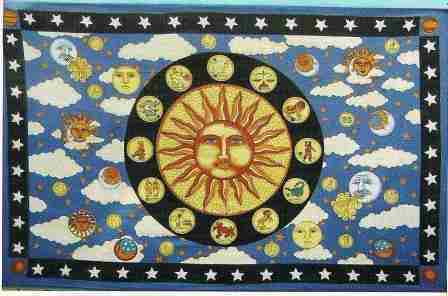 This large tapestry has the zodiac signs around the sun, with background clouds and a border of stars. It measures approximately 54" x 86". These wonderful prints are a great way to add color to your bed, ceiling, and wall. Also perfect to take along to a festival, a picnic or to the beach. For your comfort it is hand printed on 100% cotton.